Although air-source heat pumps have been available for many years, the technology has only recently been developed enough for their use in regions with extended periods of sub-freezing temperatures. Air-source heat pumps systems function by drawing heat from the outside into the home during the winter and taking the heat from the inside out of the home during the summer. 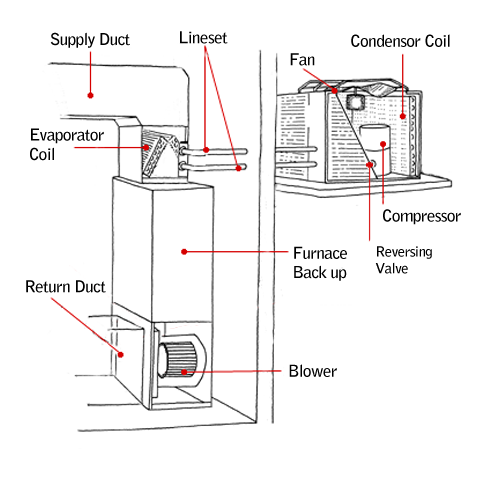 There are several major components that allow the heat pump to do this; the thermostat, the reversing valve, the lineset, the compressor, the condenser, the evaporator, the air handler, and the ductwork. The thermostat acts a control, monitoring the temperature of the house, and determining in which mode the system should be functioning. The reversing valve controls the direction of refrigerant flow. The flow determines whether the system is providing heating or cooling. The Lineset consists of two pipes connecting the indoor and outdoor units, one carrying refrigerant in a gaseous form, the other, in a liquid. The compressor resides in the outdoor unit and is responsible for compressing the refrigerant in the system from a gas into a liquid. The condenser is one of the two sets of coils containing refrigerant. When the unit is set to provide heat, the outside coils act as the condenser while the indoor coil functions as the evaporator. In cooling mode, these two are reversed. In the condenser heat is extracted from the air as the refrigerant turns into a gas. The gaseous refrigerant is sent via a lineset to the evaporator coils. In the evaporator coils, the refrigerant releases the heat stored in it and begins to turn back into a liquid. The air handler is a blower system that blows air across the evaporator coils extracting the heat (or in the case of cooling, blowing the hot air over the coil for the heat to be extracted)into the system’s ductwork, and into your home. Heat Pumps are one of the most heating and cooling systems that you can install. The system serves the dual purpose of both heating and air conditioning the home. The compressor is located outside the homes in typical residential split units, reducing the noise of the system. Heat pumps come in several different forms including ducted and ductless units, split or packaged units, and multi-zone or single-zone units, providing the customer with a range of options. The initial cost of installation may be more expensive. Although operating savings can offset the cost. In regions of sub freezing temperatures, efficient operation of a heat pump is hampered. Heat Pumps require yearly maintenance.